While your cat may seem extremely self-sufficient, it’s up to you as the pet owner to ensure your kitty is in optimal health. From scheduling regular checkups with your local veterinarian to making sure your feline has all of the shots he or she needs to guard against illnesses, there are many things pet owners should do to ensure their cat’s health is up to par. In this blog, we’ll look at a few common cat ailments, including urinary tract diseases and cancer, so you’ll be able to spot warning signs that your little furball may need medical attention in the future. If you live in the Los Angeles area and you’re looking for mobile veterinary services for your cat or dog, contact the professionals at 911 Vets® right away. We offer a variety of services from routine house calls and emergency house calls to home hospice care and euthanasia. Contact our veterinarians today to schedule an appointment or to learn more about our services! Lower urinary tract disease, also known as FLUTD, can encompass a variety of different conditions that can affect your cat’s bladder and urethra. If your kitty has stopped using the litter box or you notice that your furry friend is in pain when they try to urinate, there could be an issue with your kitty’s urinary tract and you should seek medical attention right away. 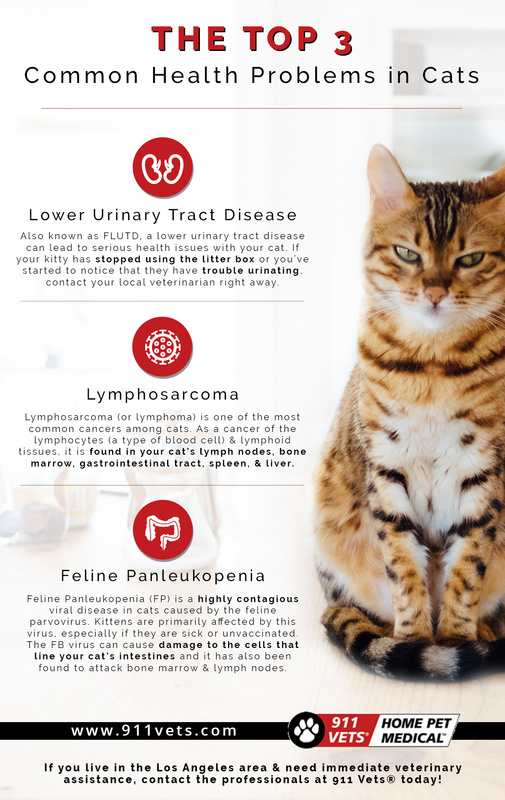 The first step in treating FLUTD is identifying the cause of your cat’s symptoms, and a licensed veterinarian will be able to help. Some culprits for FLUTD include bladder stones, urinary tract blockage, infection, and even kitty cancer. The most common type of cancer in cats is known as lymphosarcoma, which is a cancer of the lymph system that can be associated with the feline leukemia virus. Lymphosarcoma accounts for one-third of all malignancies in cats and can occur in places like the gastrointestinal tract, kidneys, and spleen. Symptoms of cat cancer can include lumps, swelling, sores, lethargy, weight loss, skin infections, and sudden lameness. The most common types of infections in cats are respiratory in nature, and some can be prevented with the proper vaccinations. If your feline experiences symptoms like a runny nose, sneezing, coughing, a fever, or sores in the mouth, there’s a good chance your cat has a respiratory infection. Since some respiratory infections can be fatal, it’s important to seek immediate medical attention for your feline if he or she starts to show the symptoms above. Another very common infectious disease among cats is known as feline panleukopenia. This highly contagious viral illness is caused by the feline parvoviruses and symptoms can include fever, bloody diarrhea, lethargy, dehydration, and a loss of appetite. If you live near Los Angeles and you suspect your cat may be ill, contact the friendly staff of veterinarians at 911 Vets today. We’ll schedule a convenient time to come to your home to complete a thorough examination of your cat before recommending the best treatment solutions. Call us today!